You can sense the patience in Russ Parsons (he reminds me a bit of Michael Ruhlman): he carefully and flawlessly entertains and educates. That he reconstructs the timeline of industrialized agriculture in our country is logical and fascinating. At times, he's poetic, like when he contrasts the modern grocer's produce with "a perfect peach." The agriculture business has gotten very good at keeping food as fresh as possible along the way, but there is no arguing with time. As growers and marketers try to come up with ways to beat the aging process, one favorite technique is picking fruit earlier. To understand why they do this let's look at one surefire way to pick a perfect peach. All you have to do is go out in your backyard, find the one on the tree that is at the most perfect point of maturity and ripeness, pluck it gently from its branch, cradle it gingerly in your cupped hands and then walk quickly to your kitchen. Don't run—you might jostle it. A peach like this is a treasure, a taste to remember all your life. The book is useful and beautiful: my favorite combination. The cross-referencing is brilliant. 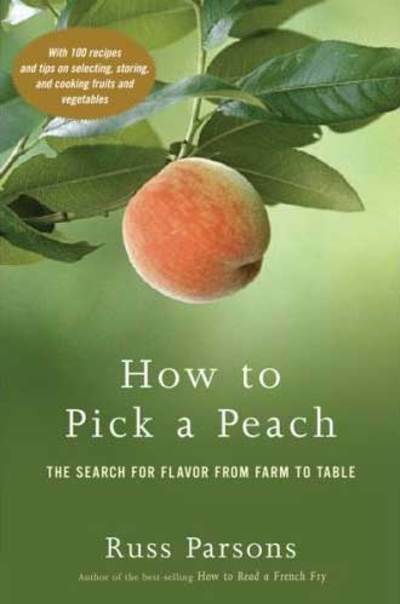 How to Pick a Peach opens with this dedication: "For all the farmers who work so hard so we cooks don't have to." Well, ya gotta love that. The Chinese have designed a stamp in honor of The Year of the Pig, and this is it. Not only is the front of the stamp "scratch and sniff," but the back, when you lick it, tastes like the sweet and sour pork you will smell. 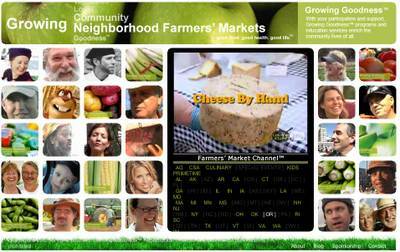 I've been busy, ramping up on two new web designs for new clients, and hope to get out to a farm soon. That's all for today, and thanks for visiting. The Year of the Pig: Not So Fast! Pictured here: these little piglets, the size of puppies, were less than a week old when I photographed them yesterday. There is nothing in the world cuter than a tiny baby pig. 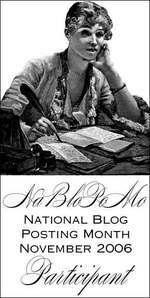 After reading over 400 new posts on blogs this morning, I noticed that some people are jumping the gun on this Year of the Pig thing. Make no mistake: I love the Year of the Pig. I am the Year of the Pig. My previous phone number was HOG-SING (and it was palindromic, too). My favorite radio station: KPIG, (107 OINK 5). But officially, the Year of the Pig does not commence until February 18, 2007. That is unusually late for a Chinese New Year: most begin in late January. So our Year of the Pig won't last even a full calendar year, alas. Nevertheless, given that TLC Ranch has nearly 400 mentions on my blog, and Justin Severino, the chef-turned-butcher who processes all TLC Ranch meat, has over 400, I think it is safe to say that pigs and pork will continue to provide lots of fodder, so to speak, for the Year of the Pig, in all its glory. Pictured here, pomegranates at the west side farmers market this morning. How wonderful is it that an organic farmer in Montana was elected to the United States Senate? It's true. State Senator Jon Tester beat the incumbent, Conrad Burns, in a tight race, but one which is over. Tester even has a blog, to which I just subscribed. 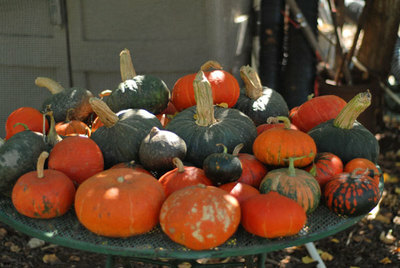 Eighty Kinds of Pumpkins & Squash! I met up with three farmers today out at High Ground Organics farm, next to the ramshackle Redman House in Watsonville. The occasion? Jerry Thomas's nephew, Steven Pedersen, had planted EIGHTY kinds of pumpkins and squashes on a pretty small piece of land—like an acre or less. The vines had gone nuts, some of them twenty feet away from where they'd been planted, and Steven and his assistant, Joanna Johnson, were out there to see if they could make order of chaos. It was like trying to detangle three hundred garden hoses. At the end of summer every year, many people are melancholy at having to bid adieu to the perfect tomatoes we adore. I am among them. Along those lines, another treatment for Early Girls is my recipe for slow-roasted tomatoes, which I call "Godiva Tomatoes." They aren't designed to last into the winter...ours barely last a day around the house. Bear with me while I get mystical.